I declare it’s officially summer now… at least for me. 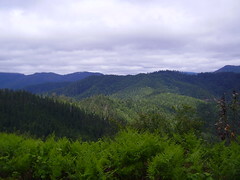 We’re back from spending Memorial Day in Oregon, lurking about near Merlin, OR and visiting Speckles and Casper – the doggie owner’s of Karen’s Aunt Pat and Uncle Bill. They have a truly amazing piece of property and get-away down there, and we definitely took advantage of it. 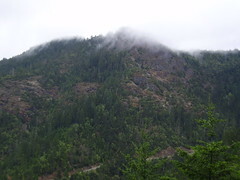 It doesn’t hurt that Bill and Pat have a couple of Quad’s down there too, and they even rented an extra one for Sunday so that the four of us could all head up in the mountain back-country a bit on dirt and logging roads to go exploring. But the reason that it’s now officially summer is that at 10pm when we rolled into Seattle, the night sky was still dusk. No stars out – a darkening blue, but definitely still dusk. That’s summer. And a really wonderful summer evening it is too – 60 degrees. Great for driving with the windows rolled down a bit. 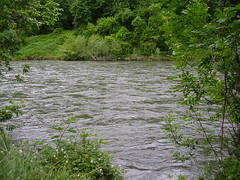 As for a southern Oregon report, it shouldn’t surprise anyone that the rivers are way up right now. The recent heat has caused it to flood up something good, with a much heavier than normal flow right now. 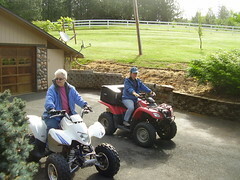 Karen got out on the quads a bit this weekend too – and it wasn’t even Bill or I harassing her to try it. She said she had a good time roaming about, and that they were fun. I think she also kept it in first gear running all about the property too. It did definitely get a bit cool up in the mountains though – I’m glad we took some windbreaker shells as well as sweatshirts and gloves. I got a fairly neat picture of the clouds rolling over a crest – although really they stayed up and out of the way for all of our trip. The weather really cooperated beautifully with our explorations.